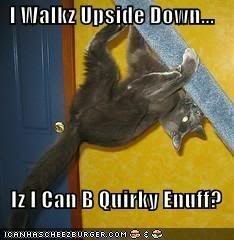 Quirky Jessi: Lol Cat--Iz I Can B Quirky Enuff? Lol Cat--Iz I Can B Quirky Enuff? And while I have the LolCats out, how about a more quirky-worthy one? some people just don't 'get' lolcats...i find i relate much better to people who do! nice....a lolcache of sorts. thanks for the blog encouragement! i was almost going to write something last night but i had zero inspiration.